ITMO University’s team “Arikaton” has qualified for the final stage of the Goldberg Cup, Russia’s first competition for creators of Goldberg machines – overly complicated contraptions that perform simple tasks. The team will present a machine that displays the movie “IT”, decorated in the film’s style. The competition values unique construction and unusual visual style of the machines. Its mission is to encourage young people to think creatively, build things and approach ordinary tasks from new angles. Goldberg Cup 2017’s slogan is “A silly format for a serious task”; Goldberg machines usually have a very simple end goal, – something like wiping someone’s mouth with a napkin or flipping a lightswitch – which is accomplished through a sequence of unusual and numerous engineering solutions. These structures rely on the domino principle, meaning that each action gives motion to another. The initial impulse is usually given by a human, who starts the chain of energy transfer: pushes a ball, swings a pendulum, knocks a brick off a shelf, for instance. What matters is that the actions follow one another and the elements not use any external power sources – although the mechanisms may employ batteries. The concept originated in the works of American cartoonist Rube Goldberg, who, in early 20th century, was known to draw newspaper cartoons involving overly complicated machines. The concept became ingrained in the public mind and in 1949 the first Goldberg machine competition was held at Purdue University. Gradually, similar contests began to pop up all over the world. These days, participants show off not just their engineering skills, but also their creative touch. Some of the criteria for evaluating the participants’ machines at competitions include the use of special effects, aesthetics and originality. To understand how diverse and, indeed, beautiful such a machine can be, one might watch the famous viral music video to OK GO’s song “This Too Shall Pass”. The final action – a salvo from four paint cannons, occurs only after almost three minutes of action. The sequence involves all the traditional elements of a Goldberg machine: balls, pendulums, water, air bursts, swings and other sources of kinetic energy, as well as some so-called “visual effects”, i.e. elements that exist outside the chain and serve to make the process more spectacular. 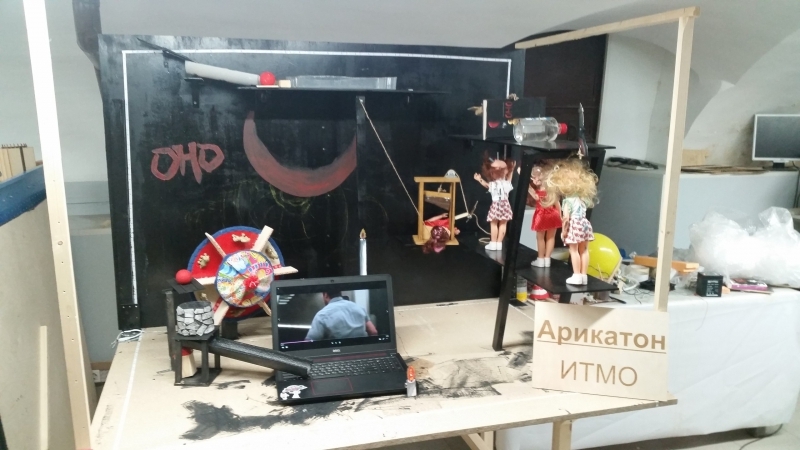 This year marks the first time a Goldberg machine competition is held in Russia. The event is sponsored by the Russian Venture Company and the federal program for the creation of Youth Centers of Innovative Creativity (YCIC). 58 teams from 28 regions of the country took part in the qualifying round – that’s 180 students from 43 universities. “Goldberg machines let students show off not only their engineering skills, but their creative side as well. That’s why teams need to have people of all kinds, including designers and engineers. In Russia, these machines aren’t very popular – some of our participants first learned about them only when they got involved. Still, there are some places in Russia where you can try your hand at making one. 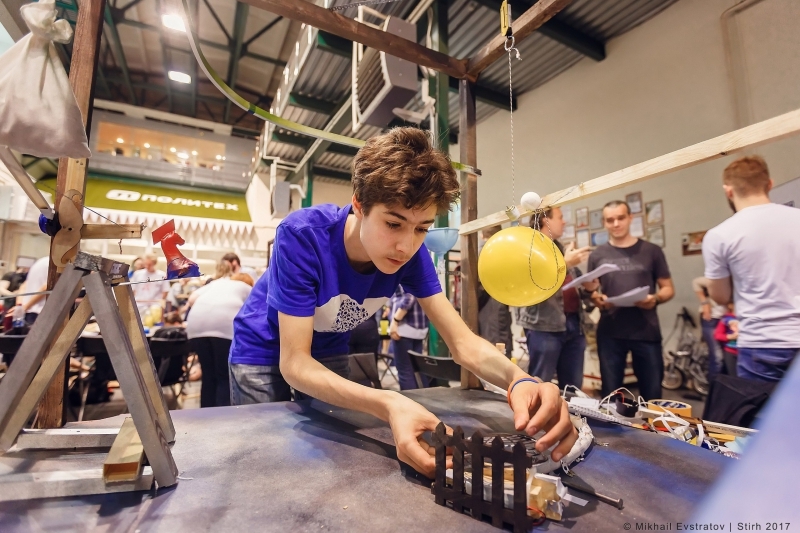 For instance, there is a Goldberg machine section at the WorldSkills competition, and one of our judges, Anatoly Shperkh, teaches a course in creative engineering to schoolchildren that involves elements of these machines; he also organizes marble-run competitions. Our Cup simply elevates this activity to a higher level,” – explained Yulia Golubeva, one of the event’s organizers. To take part in the competition, teams must first present a summary of their project. All teams that pass the qualifying round are joined by a mentor who gives them advice and tips on how to improve their creation. All the teams have been awarded monetary grants from the Russian Venture Company that will go towards building the machines. Final events will be held on October 19 and 20 at the International Youth and Student Festival in Sochi, where 11 teams from all over Russia will present their final projects. Winners will receive a monetary prize from the Goldberg League and a special award from the YCIC project office – a trip to the FAB14 Symposium in Toulouse, France in 2018. The forum brings together representatives of international student FabLabs. The teams’ projects deal with ecological issues, the production of copper, student life and other diverse topics. Some of the works are made in the style of popular films, videogames, pop-art and science fiction. Live plants, action figures, model trains, planes and automobiles, robots, Newton’s cradles and other unusual elements will fall, roll, stick to magnets, open, press buttons and activate hidden effects. Per the contest’s rules, the machine's operation procedure must involve at least 15 steps and take 20 to 120 seconds from start to finish. No elements must leave the 8 square meter area in which the machine is placed. Thus, the participants are faced with a genuinely complex engineering and creative task that requires precise planning and originality. In the Goldberg Cup’s final stage, ITMO University is represented by the team Arikaton, made up of five students from the Faculty of Control Systems and Robotics. 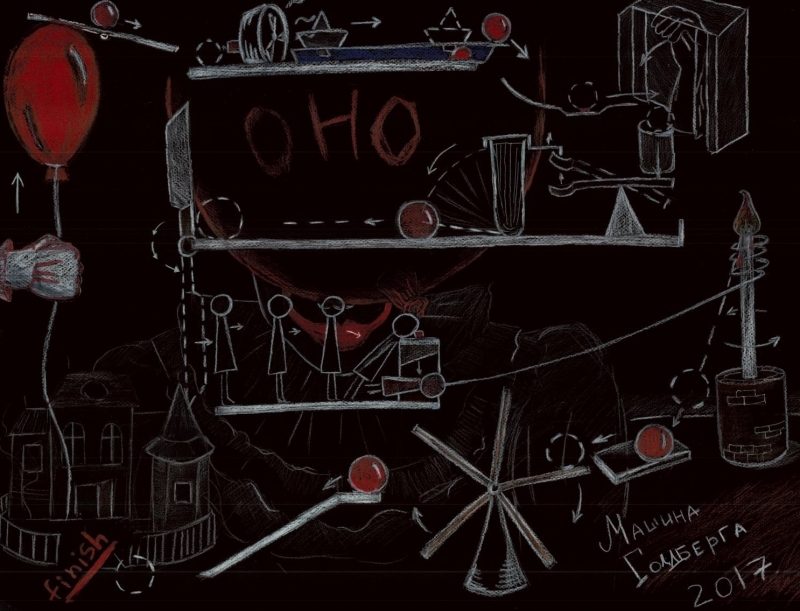 The project’s visual design is a key part of it: the machine is inspired by the movie IT based on a novel by Stephen King; the end goal of the entire structure is to press “play” on a laptop and start the movie. “Initially, we didn’t make any calculations – we simply sketched out the machine and then assembled it based on the drawing. We didn’t have as much time as we would have liked, so we’re still finishing up some of it here, in Sochi. Per the competition’s rules, we’re not allowed to deviate from the sketch we submitted with our application. As this is our first time taking part in something like this and we only learned about it shortly before the deadline for applications, we’re placing the emphasis not on the engineering component of the machine, but the artistic one,” – says team captain Stanislav Ryzhov. The idea for the project came about very simply: the day before they came up with it, the students went to the movies. In their work, they drew inspiration from various sources and examples and were especially impressed with the machine built by Red Bull – which features actual famous athletes as its elements. At the qualifying round, the team scored 25 points, as compared to 29 points earned by the current leader of the competition – the team from Bashkir State Pedagogical University. The final competition will be streamed live on the Goldberg League’s website on October 20, 9:30 AM (Moscow time). A special “viewers’ choice” award will be given out to the team most favored by the livestream’s viewers. We are pleased to report that Goldberg Cup 2017 has concluded and ITMO University’s team will be taking home the viewers’ choice award! DreamDorm.Shine Contest: Prove YOUR Room is the Best!